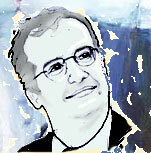 15 April 2008: The election of Walter Veltroni as the leader of Italy’s new centre-left bloc caps a career so far as a national politician, city mayor, journalist, novelist and even film star. A former Deputy Prime Minister, Veltroni was first elected mayor of the Italian capital in 2001 and re-elected overwhelmingly in 2006. In October 2007 he was chosen as the first leader of Italy’s new Democratic Party, tapping him as a possible successor to Romano Prodi as Prime Minister. The former mayor was short-listed for the 2008 World Mayor Award. On 13 February 2008 Walter Veltroni resigned as mayor of Rome to focus on his campaing to become Italy's next prime minister. He conceded defeat in national elections held in Italy on 13 and 14 April 2008. On 28 April 2008 Gianni Alemanno, a former youth leader of Italy’s neo-fascist Socialist Movement, won Rome’s city hall for Silvio Berlusconi’s centre-right People of Freedom Party. Veltroni, a Marxist firebrand in his youth, is now as comfortable in the company of Vatican figures as leading lights of the Communist Party. According to the British Independent newspaper, Veltroni embodies what La Repubblica defines as “buonismo”, the new vibrant, optimistic and benevolent Italian spirit of the age. Opponents on the other hand dismiss this as a veneer to obscure the true state of Rome’s public realm but Veltroni exudes a palpable hunger to govern and lead, as demonstrated by his candidature and subsequent landslide vote in the first election to head the country’s new centre-left party. The decision to merge the disparate array of Italian left parties was sought by Prime Minister Romano Prodi, who heads a coalition of 10 parties known as ‘The Union’, ranging from three Communist successor parties to the ‘Daisy’ alliance of centrists. The tiny Pensioners Party was a member of The Union for 2006 General Election but has rejoined Silvio Berlusconi’s right-wing opposition bloc, The House of Freedoms. Observers note the dropping of any mention of the left in the Democratic Party’s (PD) name in the same way that some of its component parties ditched Marxism and Communist insignia a decade and a half ago. Veltroni’s leadership of this new slick but de-radicalised progressive party is seen by some as the fruition of his signature ‘all things to all men’ approach. The fragmented nature of Italy’s political scene owes as much to the country’s infamous proportional electoral system as to post-war history and its tendency towards regionalism. The forces of the left in Italy, grouped around traditional class allegiances among the industrial base, particularly in the less affluent south, were fragmented between the Italian Socialist Party and the Italian Communist Party (PCI). As in France, Italy’s Eurocommunists played a significant role in post-war politics and their successors continue to do so today. The collapse of the Soviet Union and the subsequent restructuring and rebranding of most European Communist parties saw the Italian Communist Party fragment into the Democrats of the Left (DS, the party of current Italian President Giorgio Napolitano) and the Communist Refoundation Party in 1991. Veltroni began his political career as a PCI member of Rome city council in 1976 and became a deputy in parliament for the party in 1987, before becoming editor of the DS-supporting daily newspaper l’Unitá in 1992, a post he held until 1996 when he successfully stood as Romano Prodi’s vice premier in that year’s General Election. In 1998 he became DS National Secretary. The Italian right traditionally grouped around the Christian Democrats, dominant throughout most of the post-war period. Both the Socialists and the Christian Democrats suffered under the Tangentopoli scandal of the early 1990s when political graft and links to the mafia were found in both parties. The 1990 revelation of the existence of the Gladio network of right-wing paramilitaries designed to counter any invasion by the Warsaw Pact or the prospect of Communists being returned to power by democratic means, vindicated years of allegations that a “shadow government” existed in the form of a “black” Masonic lodge P2, which collaborated in both mafia activity and political assassinations. The assassination of left-leaning Christian Democrat Prime Minister Aldo Moro in 1978 (supposedly by the Red Brigades) and the 1980 Bologna massacre, in which 85 people were killed, is widely assumed to be its work. The network was also connected to Latin American military dictatorships of the time. Future Prime Minister and Forza Italia founder Silvio Berlusconi was known to be a member of the lodge. Forza Italia’s candidate for the 2001 mayoral election in Rome was Antonio Tajani, whom Veltroni defeated. In his 2006 mayoral re-election, Veltroni trounced the right’s candidate, former agriculture minister Gianna Alemanno of the far-right National Alliance (the successor party to the Italian Social Movement established by supporters of the late Benito Mussolini in 1946). In 2005 Veltroni was named one of five European ‘Town Hall Titans’ by Time Magazine, alongside Bertrand Delanoe, Ken Livingstone and Klaus Wowereit. The same year he provided the Italian dubbing for the character of Mayor Turkey Lurkey in the Disney animated film Chicken Little. He also appeared briefly in the Ian McEwan novel Saturday that year. Such showbiz activities, not least his national political ambitions, have further damaged his reputation among both opponents and ordinary Roman citizens, who have criticised the neglected state of the city’s roads and subway system during his five years in office. Veltroni’s administration however has prided itself on its sound finances and the capital’s resurgence as a leading European hotspot of culture and entertainment, regaining the spirit of La dolce vita after the troubled Tangentopoli era. Rome is governed by several layers of government, starting with the Province of Rome (itself one of five in the Lazio region), which is divided into 121 communes largely covering the metropolitan area of the capital. The municipality (or commune) of Rome is subdivided into 19 administrative units (or municipi). Some debate is on-going regarding the possibility of restyling the Italian capital as a metropolitan region in its own right, to reflect common practice elsewhere in Europe. Nikitas Kaklamanis, a medical doctor, former European parliamentarian and government minister, became Athens’ 50th mayor at the beginning of 2007. The new mayor has the unenviable task to follow in the footsteps of Greece’s internationally best-known politician Dora Bakoyannis, who, during her term of office, transformed the city ahead of the Athens 2004 Olympics and, consequently, won the World Mayor Award in 2005.